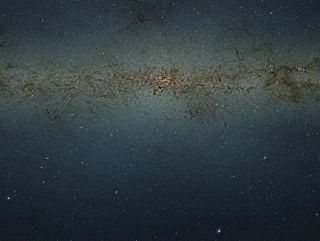 This view of the central parts of the Milky Way was obtained with the VISTA survey telescope at ESO’s Paranal Observatory in Chile. The huge picture contains nearly nine billion pixels and was created by combining thousands of individual infrared images from VISTA into a single monumental mosaic. The image is too large to be easily displayed at full resolution. Astronomers have catalogued 84 million stars at the heart of the Milky Way galaxy using an enormous cosmic photo snapped by a telescope in Chile, a view that is billed as the largest survey ever of the stars in our galaxy's core. The staggering 9-gigapixel picture was created with data gathered by the Visible and Infrared Survey Telescope for Astronomy (VISTA), an instrument at the European Southern Observatory's Paranal Observatory in northern Chile. The zoomable image is so large that it would measure 30 feet long by 23 feet tall (9 by 7 meters) if printed with the resolution of a typical book, researchers said. The catalogue derived from the new image contains 10 times more stars than previous studies have provided. It should help astronomers better understand the structure and evolution of our home galaxy, researchers said. The huge new picture probes the Milky Way's central bulge, a concentration of ancient stars found near the core of most spiral galaxies. Getting good looks at this region is not an easy task. "Observations of the bulge of the Milky Way are very hard because it is obscured by dust," said co-author Dante Minniti, also of Pontificia Universidad Catolica de Chile. "To peer into the heart of the galaxy, we need to observe in infrared light, which is less affected by the dust." VISTA was able to do just that, snapping thousands of infrared images that were combined to generate a monumental color mosaic measuring 108,200 by 81,500 pixels. It's one of the biggest astronomical images ever produced, researchers said. Astronomers identified 173 million different objects in the 9-billion-pixel image, of which 84 million could be confirmed as stars. The rest were distant objects such as galaxies, or they were too faint or blended to be identified conclusively. Saito and his team then plotted the brightness of each star against its color, creating a color-magnitude diagram with 84 million data points. These diagrams are valuable tools, helping astronomers study star properties such as temperature, mass and age. "Each star occupies a particular spot in this diagram at any moment during its lifetime," Minniti said. "Where it falls depends on how bright it is and how hot it is. Since the new data gives us a snapshot of all the stars in one go, we can now make a census of all the stars in this part of the Milky Way." The astronomers are making their data publicly available, so other research teams can use it to make exciting finds of their own. The team published their results in the August issue of the journal Astronomy & Astrophysics.